The fact that you are a Linux user shouldn’t stop you from playing great games. Fortunately, the developers share the same opinion, which is why many of these fantastic titles are optimized for Linux. As the biggest gaming storefront out there, it was only natural to expect that Steam would make an effort to offer Linux support. The only question to answer not is – are there free Steam games available? That is what we are trying to reveal in this article, and here is the top 10 list we discovered. We are starting with a simple casual clicker game intended for all those who love business simulations. Adventure Capitalist puts you in the role of a business owner. You started a new company, and your goal is to expand as far as possible. Even the sky won’t be the limit for you because why wouldn’t there be an option to set an office on the Moon or Mars? Adventure Capitalist is free to play the game, but keep in mind that there are in-app purchases available. They can help your business to progress more quickly. Fortunately, even if you do not invest real cash, you can still enjoy this great game. War Thunder is another proof that great games do not have to cost any money. The Russian developer Gaijin Entertainment created this war simulation set in the timeline of World War II. You can play it in a single-player mode, online co-op, and multiplayer and it even has support for VR headsets. That means an endless range of options to add to the replay value of the game. As you progress, you will unlock new tanks and aircraft. If you want all the extra equipment to be unlocked right away, an option of making in-game purchases is always available. Here is an interesting twist on the first-person shooters you might know. Aside from the simple concept to stay alive and kill others, Empires added a layer of strategy to this game. The title is multiplayer only, and one of you will get to play as a commander whose task it to place structures, issue orders and develop the entire squad. Other teammates will be tasked with executing those actions as soldiers. Aside from shooting, they can also drive cool military vehicles. Empires Mod has been around for more than a decade, and although it doesn’t have a large fanbase, it is an extremely cool game you should try. It is time to stop the nonsense and mention the biggest player in the industry when it comes to free Steam games. Dota 2 has been around for six years, and it has been one of the leading MOBA games on the market. The idea is simple – two squads play against each other, and each of them consists of five players. The task is to win the match, which requires to destroy the headquarters of the opposing squad. Each player controls a Hero that can have different equipment and abilities at their disposal. Based on that, you utilize your skills to contribute to your team’s victory. Dota 2 is a mixture of strategy and action with plenty of features added over the years. If you are a fan of Overwatch, here is a free alternative you should consider. The premise is simple – you assume the role of a Champion and try to shoot your way to victory. Paladins put you in teams, which means that you will need to work together with your teammates to get the win. Depending on the character you select, you can play at the front line, attack from the flank, or work as a support member of the crew. Thanks to the various methods of communication, including voice chats and text messages, this game can become incredibly interesting. If you have always been a fan of robots or engineering, you will enjoy Robocraft. Similar to the concept of Lego, you use blocks to build a vehicle that you will use during the battle. The graphic is cartoonish and uses vivid colours, which makes this game suitable for all generations. For those who dream of becoming engineers, the building concept is extremely engaging. However, the combat is nothing less exciting and high-paced. The ability to repair and upgrade your vehicles depend on points that you earn while playing. Have you ever heard of visual novels? While many do not consider them the actual games, the truth is that thousands of players love playing through these stories and enjoying themselves. In Regeria Hope, you assume the role of a lawyer, which is a concept you might know from the Ace Attorney or similar games. Do not let the anime graphics make you think that this is a simple game. You will be playing as an attorney who needs to fight for their client’s freedom by using nothing than their knowledge and logic. You will have to make difficult decisions as the game is filled with complex characters and intriguing cases. The free to play games are mostly multiplayer, and Valve uses the same approach in their Team Fortress two action FPS. The interesting thing to mention is that this title has been around for over a decade, and it has maintained a loyal fanbase for such a long time. TF2 doesn’t offer anything unusual – a wide range of classes to select, as well as personalities and tactical abilities for your character. The thing that has kept this game going for a long time is that the developers make constant updates, adding maps, modes, and aesthetic items. Awesomenauts offers an intriguing approach to the MOBA genre. They decided to combine the 2D platformer with the action genre, and it resulted in a beautiful and high-paced game that everyone will enjoy. The graphics are beautiful and, although the game seems cartoonish, you will need strategy and team play to come out as a winner of the session. The teams are divided into two squads of three – can you secure a victory for your teammates? Zombie games are nothing new in the gaming industry, but Unturned tries to offer a fresh and innovative approach to the genre. In this game, you are still alive, and you need to ensure to remain so even though the zombies are everywhere. If you decide to play in the co-op mode, surviving will not only be easier but also more fun. Although it seems dark, Unturned is a casual game that you can pick up and play whenever you have some free time. We can learn two important things from this article. 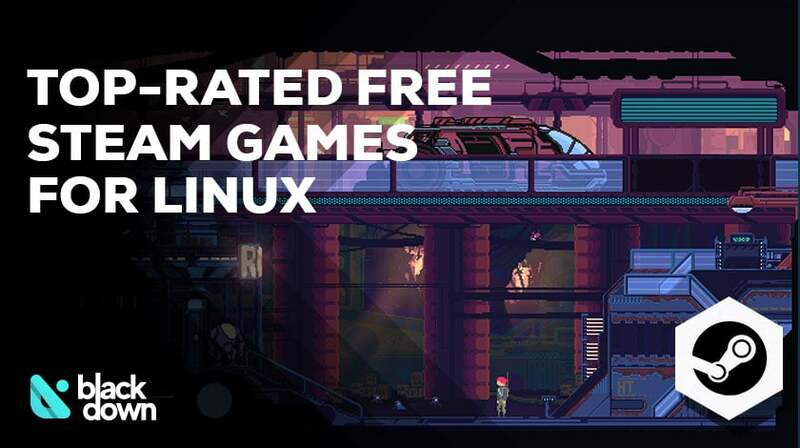 First, you can choose from a wide selection of games even if you are a Linux user. Second, why would you pay to play when you have so many great free Steam games available out there? Take another look on our list, pick your favourite genre and enjoy your time playing solo or with friends!